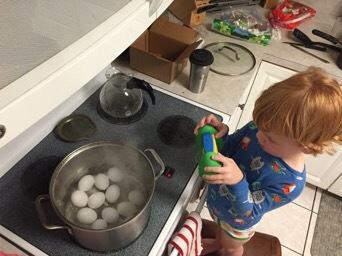 Last year, I didn’t even bother trying to dye Easter eggs with Henry since he was only one, and I remember the process as a kid being a whole lot of waiting and not a lot of doing (something 1 year olds don’t excel at). We made carrot cake cookies instead, and he loved it. 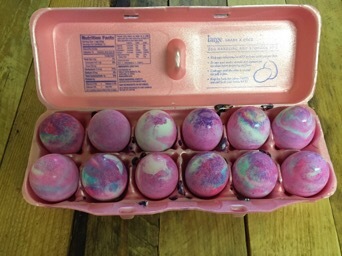 So this year I decided we were going to dye eggs, but needed to decide how. 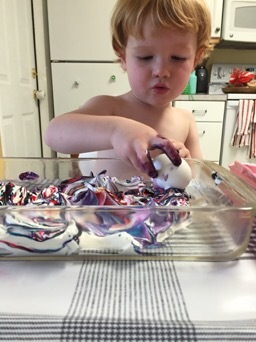 Should we use the same kits I used as a kid (eww, vinegar smell), dye eggs with natural dye from fruits and veggies (don’t really have the energy to round up different food items to make the dye, and Henry won’t care much anyways), or find an alternative on Pinterest? 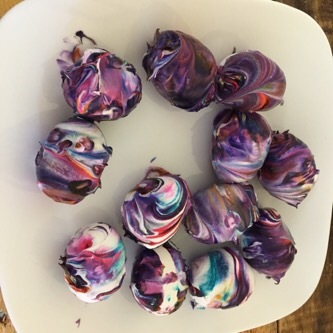 I went with choice three and found an easy way to dye eggs using shaving cream and food coloring. Except I replaced the shaving cream with cool whip because the Hen still has a occasional tendency to put things in his mouth, and I figured the pretty colors could be a temptation (they weren’t, but it smelled nice). Henry chose how much dye we put in the cool whip (yay pink! 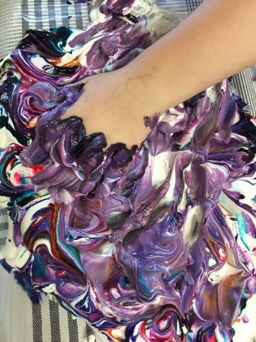 ), and then helped me swirl it all around. Now we were ready to color the eggs and get really messy! I demonstrated how to do it, and Henry jumped right in. For two whole eggs, he loved it, and was quickly over it. He wanted me to do the rest so he wouldn’t get dirty. This from the kid who lives and loves to get as dirty as possible. Don’t worry, he made up for it after I finished the eggs and put them aside to dry. 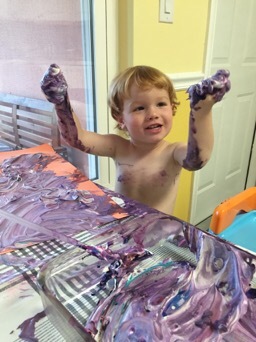 There was plenty of the colored cool whip left, so I grabbed some paper and let him finger paint. This was exactly what he was waiting for. 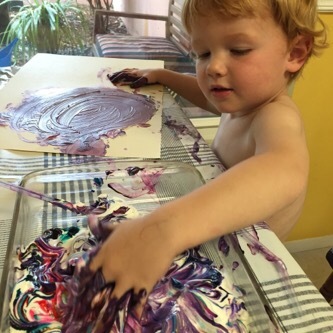 Thick globs of purplish-bluish- pink dessert topping were spread all over the paper (and him). 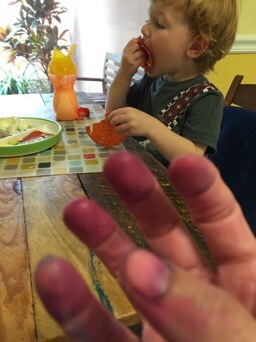 He was having a blast, as I was trying to figure out how to get food coloring off of myself since I now had dyed hands and a boy quickly turning purple like Violet Beauregard in Willy Wonka. Thanks to a quick Google search, I found that a first wash of soap and warm water followed by a vinegar scrub cleaned us mostly up (except my nails, but I’ve been meaning to paint them for Easter Sunday anyway). 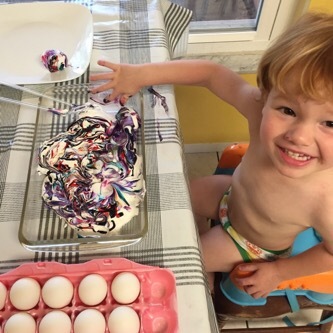 After Henry was all cleaned up and eating lunch, I rinsed the eggs and love their finished tie-dye swirls. It was a super fun activity for a rainy Holy Week morning.